As a satellite conference of the 1998 International Mathematical Congress and part of the celebration of the 650th anniversary of Charles University, the Partial Differential Equations Theory and Numerical Solution conference was held in Prague in August, 1998. With its rich scientific program, the conference provided an opportunity for almost 200 participants to gather and discuss emerging directions and recent developments in partial differential equations (PDEs). This volume comprises the Proceedings of that conference. In it, leading specialists in partial differential equations, calculus of variations, and numerical analysis present up-to-date results, applications, and advances in numerical methods in their fields. Conference organizers chose the contributors to bring together the scientists best able to present a complex view of problems, starting from the modeling, passing through the mathematical treatment, and ending with numerical realization. The applications discussed include fluid dynamics, semiconductor technology, image analysis, motion analysis, and optimal control. The importance and quantity of research carried out around the world in this field makes it imperative for researchers, applied mathematicians, physicists and engineers to keep up with the latest developments. 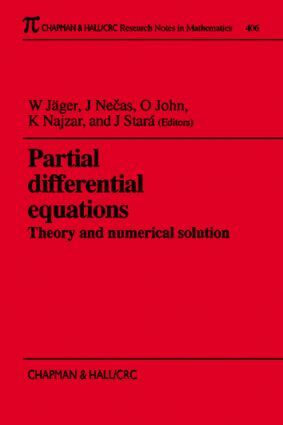 With its panel of international contributors and survey of the recent ramifications of theory, applications, and numerical methods, Partial Differential Equations: Theory and Numerical Solution provides a convenient means to that end.